De Glazen Toren launched in 2004 with the mission of brewing unfiltered quality beers in a time-honoured, traditional manner using modern brewing systems, while using only the best ingredients, without any additions or artificial methods. Besides their home market, the export beer to the USA, Japan, Sweden, Canada, Austria, Denmark and Australia. 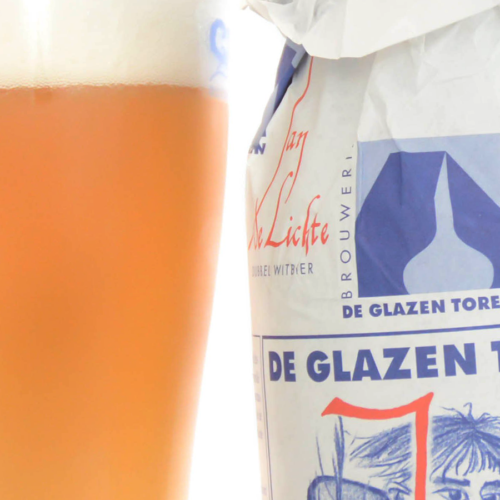 Tha Glazen Toren Jan De Lichte is an Imperial White Ale, a bigger 7% version of a traditional Belgian Witbier. It pours cloudy and has refreshing grapefruit and coriander flavors with a long, dry finish. The Belgian white ale is refreshing and elegant in its simplicity. Drinkers will enjoy a grainy bread-like malt flavor, orange and lemony citrus fruits and a touch of coriander, or other spices. The key to all the flavors in Witbier is balance; none should outshine the others. This base style is about 400 years old.